Don’t let wasps ruin your lunch! Wasps are not the most popular buzzy creatures out there. They have a pretty terrible reputation for ruining alfresco summer meals and some are killing honey bees, but wasps are not always annoying and they are not all villains. In fact they are actually really beneficial in gardens. 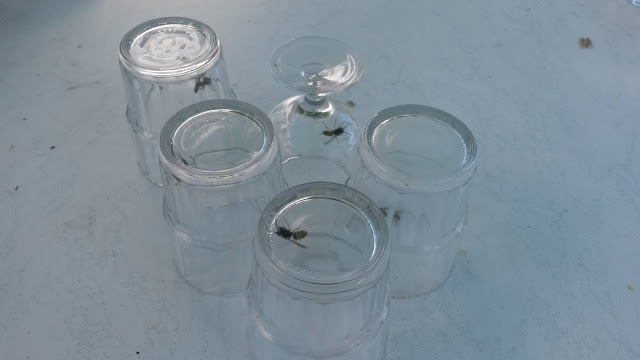 We did this last summer and instead of feeling annoyed by the wasps or retreating inside, wasp catching, observing and then releasing became a fun activity that my kids got pretty good at! This entry was tagged beneficial insects, bugs, eco, eco tips, ecothrifty, family budget, Frugal, Green, insects, money saving tips, thrifty, wasps, wildlife, zero waste. Bookmark the permalink. ← 12 wonderful ways to use up ground almonds! What a simple and brilliant idea. I didn’t know that wasps ate aphids which are appearing on my leafy greens right now. I will appreciate them more in the future! Great post. I love this! Always game in looking at the flip side and reason for every living creature, especially the ones that get bad press. We like wasps in our family. They never seem to bother us for long and kindly asking them to leave nicely seems to work, but I do also like your upturned glass advice Ecothiftyliving!